The mysteries of yesterday demand to be solved, but in the world of Archaeology Professor James Acton, sometimes it's safer to leave the past alone. Enter a world where the past and present confront each other, where friends and enemies aren’t always clear, where history invades the present with a vengeance, and where no one man can survive without the help of the woman he loves. And a few good men. 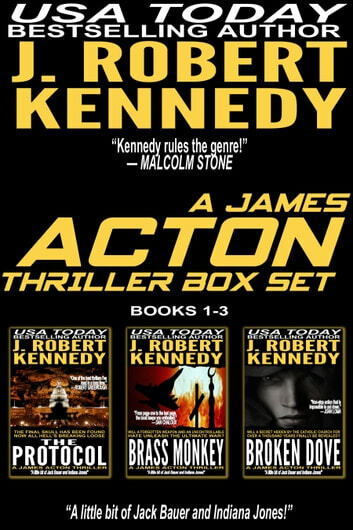 The James Acton Thrillers Series: Books 1-3 includes the first three full-length novels in this action-packed series described as “a little bit of Jack Bauer and Indiana Jones.” If you like your action and intrigue mixed with history, then you’ll love J. Robert Kennedy’s USA Today Bestselling series. 900+ pages. 3000+ five-star reviews. Find out why over a half a million readers have fallen for USA Today bestselling author J. Robert Kennedy’s thrilling series! Buy the box set now and get three full-length novels that will leave you breathless! THE FINAL SKULL HAS BEEN FOUND. NOW ALL HELL’S BREAKING LOOSE. For two thousand years the Triarii have protected us, influencing history from the crusades to the discovery of America. Descendant from the Roman Empire, they pervade every level of society, and are now in a race with our own government to retrieve an ancient artifact thought to have been lost forever. WILL A FORGOTTEN WEAPON AND AN UNCONTROLLABLE HATE UNLEASH THE ULTIMATE WAR? A nuclear missile, lost during the Cold War, is now in play–the most public spy swap in history, with a gorgeous agent the center of international attention, triggers the end-game of a corrupt Soviet Colonel’s twenty five year plan. Pursued across the globe by the Russian authorities, including a brutal Spetsnaz unit, those involved will stop at nothing to deliver their weapon, and ensure their pay day, regardless of the terrifying consequences. When the new Pope, a member of an ancient organization descendant from the Roman Empire, assumes control of the Roman Catholic Church, an organization founded by Saint Peter himself takes action, murdering one of the new Pope’s operatives. Detective Chaney, called in by the Pope to investigate, disappears, and, to the horror of the Papal staff sent to inform His Holiness, they find him missing too, the only clue a secret chest presented to each new Pope on the eve of their election, since the beginning of the Church. 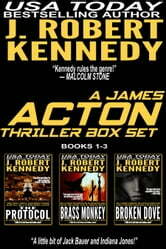 The James Acton Thrillers series and its spin-offs, the Special Agent Dylan Kane Thrillers and the Delta Force Unleashed Thrillers, have over 3000 Five-Star reviews and over half a million copies in circulation. If you love non-stop action and intrigue with a healthy dose of humor, try James Acton today! EXCELLENT FROM START TO FINISH. COULD NOT PUT BY KOBO DOWN. I loved these books. I can't get enough of this author. The stories are stimulating and exciting. I have a difficult time putting his books down to go to sleep. They are page turners to the nth degree. Also love that the author lives in my city. Just a fun, fast read of topics very present today. The three books were well intertwined. It now all makes sense as to how this group of characters came to be close friends! Well paced; you certainly will be entertained! Captivating and fast moving. Considering it's a guns and action book, I choked up a few times.